Home › News › This is Why I Love Philately! This is Why I Love Philately! Hours of enjoyment come from this hobby, even when you are a dealer. Last evening I was breaking down a collection from El Salvador and came upon a very interesting stamp. 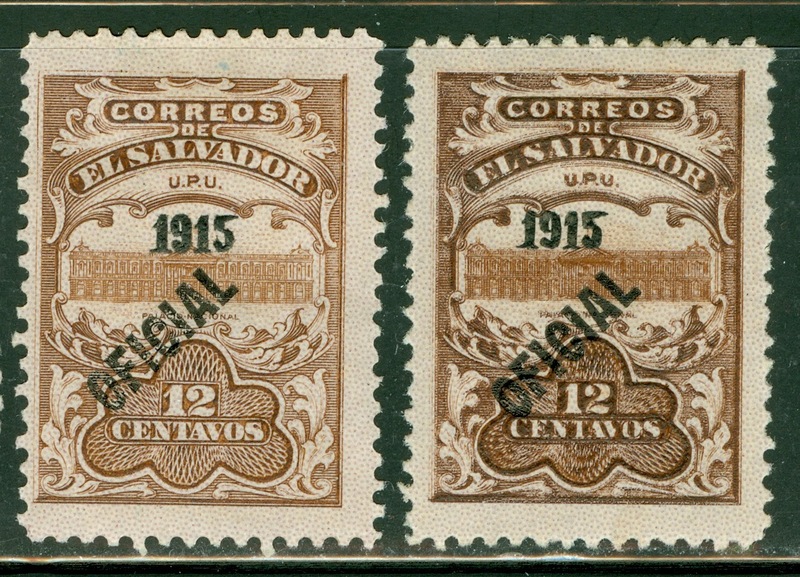 I came upon a series of official stamps that had two examples of one denomination. 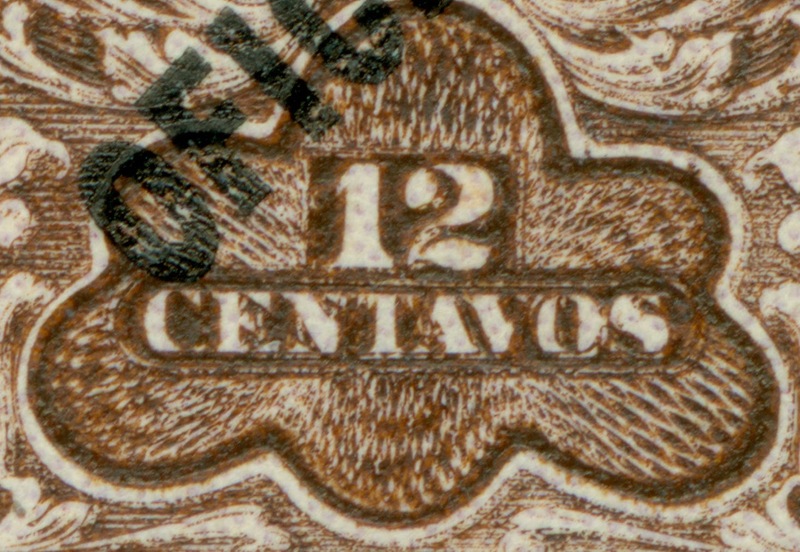 The stamp is Scott #O331, a 12c brown National Palace issue, with "OFICIAL" overprinted diagonally. The collector indicated that the second was a darker color shade variety. I looked at it and it also appeared to be at first glance just a darker version of the brown color. However, after closer inspection, the stamp on the right appeared slightly blurry. 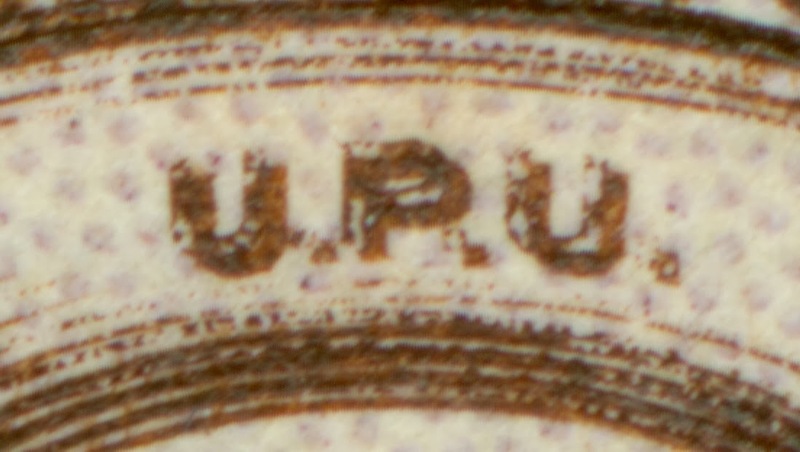 Under a 10x lupe it appeared to be a double entry; a double impression of the entire stamp. This is where modern technology takes this hobby to a different level. Under the high resolution scanner you can see so much more detail, and then share those details instantly with specialist colleagues around the globe within minutes. Take a look at the high resolution images below and notice the striking double impression, particularly in the image showing "U.P.U." just below "EL SALVADOR" at the top of the stamp. 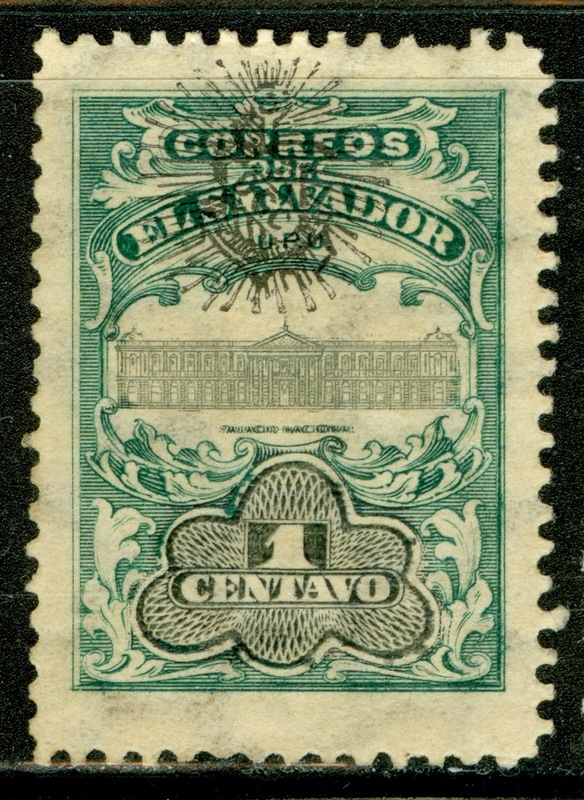 It turns out that the original stamps of this National Palace series had a very interesting printing process. 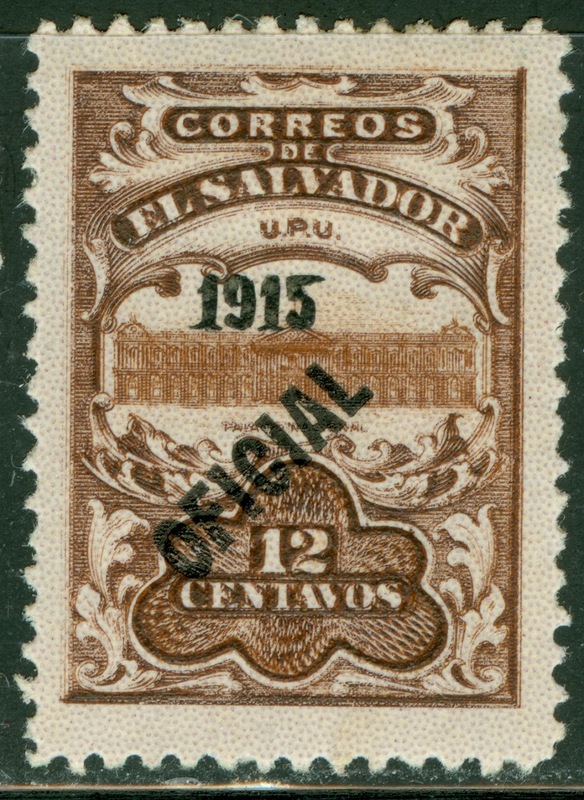 The Palace (vignette) on the original type was in black while the border was printed in different colors (an example is seen below). The very interesting printing process was described very elegantly by Joe Hahn in El Salvador Filatelico - El Faro, Year III, Number 3. Normally when printing a bi-color stamp there would be two plates; one for the first color and one for the second. This issue, though, used only one plate. The two color printing as achieved by applying ink to the frame and using chalk to block out the vignette. After the frame was printed, the reverse process was used to print the vignette. Definitely not a perfect process resulting in portions of each having traces of ink of the second color. See the doubling of the words "PALACIO NACIONAL" below... Also, look at the edges of the palace itself. While the majority of the palace is in black, the edges show some green. It's a fascinating hobby... isn't it? My sincere thanks to my dear friend and colleague Ivan Zelaya from El Salvador who provided me with the interesting literature surrounding the printing process. Why should I join a Specialty Society or Study Group?